Africa’s population explosion presents humanity us with a once-in-our-species chance to make our fastest growing area leapfrog the dirty fuels of the past to instead embrace the renewable energy of the future. 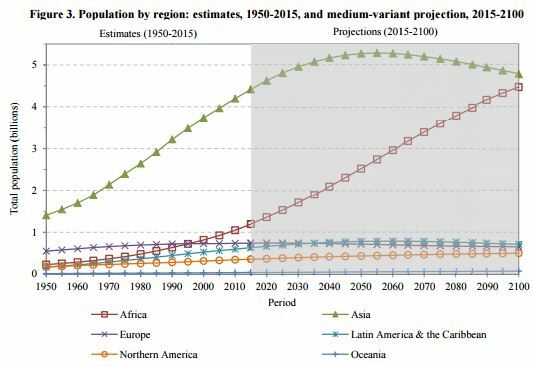 The total population of Africa is projected to roughly quadruple to about four billion by 2100, driving the total global population past 11 billion. Producing all the energy that all these people will use could obliterate any efforts we’re now making to battle climate change. Africa’s population explosion is also a tremendous opportunity, because all the power plants where all these people will get all their electricity from haven’t been built yet. This means humanity is now being presented with a once-in-the-lifetime-of-our-species shot to make our planet’s fastest growing region leapfrog the dirty fuels of the past, to embrace a future of clean, renewable energy. This is how that optimistic vision of the future can become reality. The residents of Zambia don’t need any reminders that climate change threatens their way of life. The region is suffering its worst drought in 35 years, that’s big trouble for a country that gets nearly all of its power from the force of water passing through three hydroelectric dams. No water means no electricity, and no electricity means blackouts that have frequently brought commerce and productivity to a standstill, gutting the Zambian economy and causing many to lose their jobs. All across Africa, country are confronting the same problem: a constant lack-of-power. Sub Saharan Africa — all 910 million people — consume less electricity than the 4.8 million people of Alabama. Overall, more than half of all Africans have no access to electricity. But this is changing, thanks to the emergence of renewable energy. The cost of building larger-scale solar panel and wind turbine farms continues to plummet, making governments and utilities more likely to choose them over traditional sources like hydro, coal, nuclear or natural gas. As we saw with the water shortage in Zambia — or the nuclear meltdown a few years ago after the earthquake in Japan — power stations of the past are less reliable, more expensive, far worse for our environment, and slower to build. So this seems like a no-brainer, Africa needs to go green, baby! There’re just three problems. One, until now planners have lacked the necessary data to identify where to develop wind and solar projects that are socially equitable, have low-environmental impact, and are most cost-effective. This problem was recently tackled by a groundbreaking study of 21 countries that combined satellite and ground measurements with geospatial data on roads, towns, and existing power lines. It provides the first blueprint for where wind and solar projects should be built to maximize their effectiveness. The study also revealed Africa’s eye-opening, untapped potential for renewable energy generation. There are an estimated 550 million megawatts of potential solar and wind power spread across the continent, just waiting to be harvested. That’s 3,700 times as much electricity as Africa currently consumes. That’s so much extra energy, that Africa should aim to be powered 100% by renewables by 2050. It’s even possible for Africa to become a clean energy exporting superpower by sending its abundant surpluses of electricity to Europe; the Middle East, India and the rest of Asia; and even the Americas. Of course, this is dependent on overcoming the second major challenge: the continent’s completely inadequate power grid. Modernizing it to connect clean power stations with cities all over Africa will be a long-term megaproject costing tens of billions of dollars in the coming decades. For fast-growing urban areas — like Lagos, Cairo, Kinshasa, Mogadishu, and Johannesburg — uninterrupted electricity is critical for the emerging industries that will fuel economic growth and provide jobs for billions. On the other hand, most Africans currently live in small villages and towns, so their energy needs can be met by inexpensive solar and wind turbine systems that are located on-site, but are disconnected from the main grid. The challenge will be connecting cities — where more and more people are moving — with the mega-power stations that will often be built far away, in geographical sweet spots to maximize the amount of harvestable solar rays and wind gusts.